During my time in Chicago, I ate several times at Frontera Grill, owned by famed Chef Rick Bayliss (who also owns the more upscale Topolobampo next door). I’ve been meaning to whip up some kind of enchiladas, but it just hasn’t happened yet. I saw this green enchilada sauce from Frontera at the store recently and, when I came home late and hungry today, I decided to go with it. I can’t find a photo of the pouch of sauce online (and didn’t take one), but I bought it at Meijer in the normal “taco section” so it should be easy enough to find. 1. Thinly slice any veggies you like (I went with the simple onion and red pepper) as well as half a package of savory baked tofu (two squares). I sauteed this in a little olive oil with some cumin, coriander and salt. 2. Heat up 5 corn tortillas in the microwave wrapped in plastic wrap for about 30 seconds, or in a skillet briefly. 3. 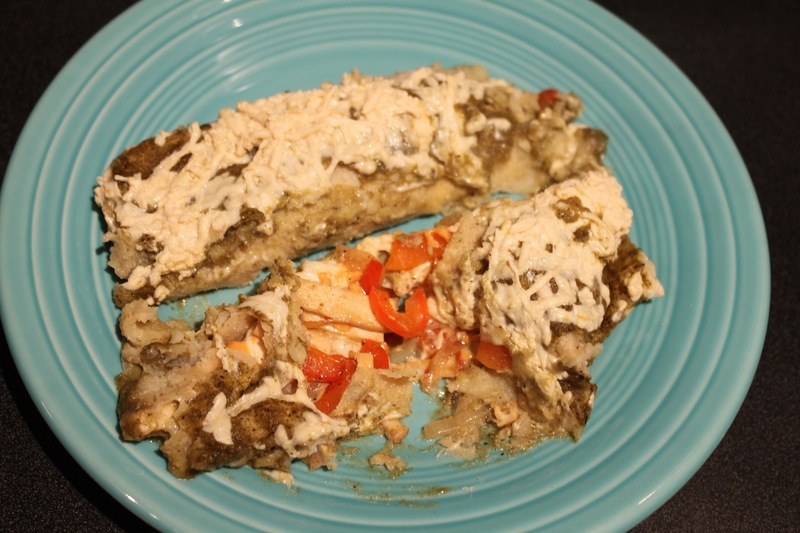 Divide veggies and tofu into the tortillas, add cheese (I went with both kinds of Daiya vegan cheese), and roll each enchilada up, placing them seam-side down in an oven-safe dish. I went with an 8×8 glass pan and five enchiladas fit perfectly. 4. 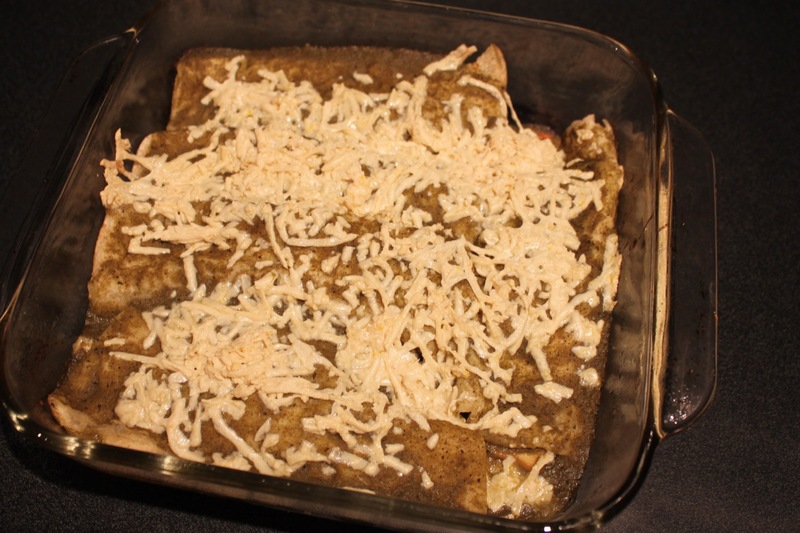 Pour sauce over top of rolled enchiladas and top with more cheese. Bake at 400 degrees for 15 minutes or until everything is heated through/sufficiently melty. This was even better than I thought it would be and took about 10 minutes to make. Then I cleaned up the cutting board and one pan I used during the 15 minutes it was baking, so now I can sit on my couch and veg (no pun intended). Obviously you could do this with any type of enchilada sauce (and I probably will), but I’ll definitely be on the look-out for Frontera’s sauces again. Entry filed under: Main Dish, Mexican, Product Reviews, Recipes, Store Bought Food Items, Uncategorized.